I’ve been taking part in local triathlons for a few years and, by my own admission, starting to do pretty well. It seems natural to want to progress but I have to admit the Ironman competition seems a step too far. But then I started to think about the Half Ironman…. Of course to properly prepare and compete you need the best tri suit for Half Ironman. That’s why I started to take a look at what’s available and which one will benefit me the most. I came to the conclusion that the 2XU Elite compression tri suit was the best suit for half Ironman. The Half Ironman is exactly half the distance of the full Ironman; that’s why it’s often referred to as the Ironman 70.3. A 1.2 mile swim, 56 mile bike ride and a 13.1 mile run has to be completed in eight and a half hours. I need the right gear on my side! I should point out that I’ve tried the two piece option and don’t like the way it rides up; for me the best tri suit for half Ironman has to be a one piece suit! That’s not to say that the right shoes and wetsuit are not beneficial! The 2XU Elite compression tri suit is without doubt the best tri suit for Half Ironman simply because of the quality of its build. It is an advancement on their own design; being stronger and more durable than any previous offering. 2XU is dedicated to providing the highest quality equipment for triathlons no matter where you are in the world. They spend hours researching and developing each product; and it shows! The 2XU Elite Compression is designed to compress your muscles encouraging proper circulation. This will help your muscles to get the nutrients and oxygen they need to keep pumping. It also facilitates the removal of lactic acid. This can be a big issue for your muscles after training or racing; getting rid of it decreases your recovery time and helps you to train harder and for longer. Also incorporated in the material are the cool touch and UV block systems. These will help to prevent you getting sunburned while competing and can actually lower your body temperature by as much as 5.4° Fahrenheit. The Elite Compression is built to last. Attention has been made to every detail; from the stitching to the material to ensure it can be used time and time again. After all, there is no point in getting comfortable while training only to discover the suit has worn out before the race. The suit incorporates memory tech LD chamois which increases the support you’ll get; particularly during the cycling stage. It also dries quickly to ensure maximum comfort and aerodynamics. You’ll notice the stitching is flatlock. This means it won’t chafe against your skin as you complete the different stages. It is also not bulky; allowing you to slide a wet suit over the top for the swimming leg; if you need to. It’s good to see a company catering for a wide array of sizes. The size goes from small to XXL; there should be something to fit no matter how you are built. However, it is important to try the suit on before you buy. A small size can be tight in the chest area but this can be relieved via the semi lock zipper on the front. However, you can’t compensate for the tight fit of a compression suit; that’s why you need to try them on to establish the right one for your needs. Compression fit is designed to constrict your body and can be beneficial. However, part of competing in a triathlon has to be your comfort level. If you don’t like the feeling of being constricted; especially on a hot day; then this may not be the best suit for you. The 2XU Elite Compression stretches to accommodate your exact figure. This helps to make it extremely comfortable. However, this stretch only lasts for a while. This can mean the suit feels less comfortable as you race. It’s important to be aware of this and test your suit before the big day. Zoot has been making tri suits since 1983 and is considered one of the leading running and triathlon sportswear providers. With their experience providing suits to the most elite athletes it’s not surprising to find that their modern suits make an excellent option for any triathlon and one of the best tri suit for Half Ironman. Coldblack technology isn’t that ne any more but the Zoot Sports Ultra tri suit uses a 225gm inset which is 82% polyester and 18% spandex. The mesh is 79% nylon and 21% spandex. The result is a tri suit that will stretch to fit your body while blocking UV rays and helping to keep you cool while running or cycling. Zoot have also added a tri carbon chamois to ensure your comfort even when racing hard. This mixes perfectly with the ultra bio wrap leg hem and reflective gripper. It will keep the suit in position while giving you additional visibility. It may not be necessary when you’re in the middle of the race but you’ll appreciate it on those early morning training runs! The leg hem is also designed to provide muscle support; helping you to go further, faster. It should limit muscle damage caused by the vibrations as you compete. In addition the Sports Ultra tri suit has anti-friction panels built into it. These are designed to prevent chaffing and help to remove excess moisture. I found they really worked! You shouldn’t need to take the tri suit off while racing but it is nice to note that it slides on and off very easily without the need for lotions. This is a blessing after completing the 70.3. There have been some reports of thigh cuts, particularly after long distance events. 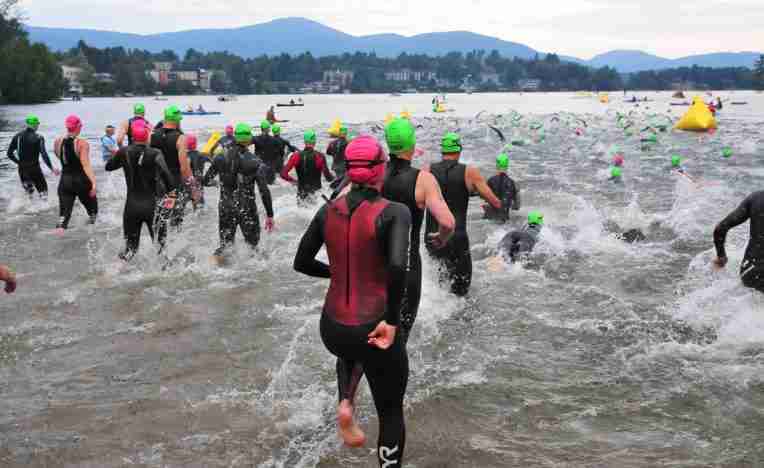 These appear to be isolated cases but it is important to assess the comfort and the fit of your tri suit before you decide it is the best tri suit for half Ironman. To many competitors, this is a disadvantage. Compression suits help to boost circulation and improve your performance and endurance. However, some people think they are too tight; in which case the lack of compression is an advantage; not a disadvantage. 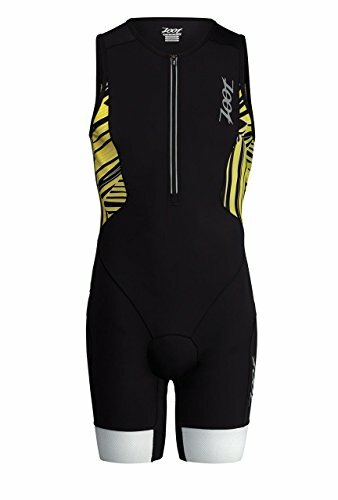 The Zoot Sports Ultra tri suit can be bought as men’s or women’s. The women’s version has a built in bra but the support it offers is inadequate. This leaves you needing to wear a second bra and risk chaffing or suffer the pain associated with a lack of breast support. It is also worth noting that some users have reported chaffing issues thanks to the zip; there is no flap protecting it from contacting your skin. Synergy is dedicated to producing the best possible triathlon gear. The company was founded in the early 1990’s by Stefan Laursen who was a successful professional triathlon competitor. His need for better gear resulted in the birth of a company. Today it is still dedicated to making the best possible gear. As a competitor Stefan knows the issues with chaffing. This suit has been designed to eliminate them. There are large armholes, soft leg grippers (made from silicone) and even an adjustable zipper to help ensure the fit is perfect. In addition the stitches are all flatlock; this prevents them from irritating your skin in each part of the race. It’s worth noting that every seam is also triple stitched to ensure there are no embarrassing moments. The fabric has been created to provide the advantages of compression suits without the feeling of being restricted. This helps you perform better and remain comfortable. This material is also designed to be exceptionally durable and breathable; maximizing your comfort as you race through each stage. In fact, you should notice the suit is almost instantly dry when you leave the water! The Synergy tri suit is designed to provide the maximum amount of buoyancy for the swimming stage of your triathlon. This will help you to occupy the perfect, slightly downward, position and get your best swimming time yet. The legs are snug as they utilize compression materials; helping to maintain blood flow and keep your legs pumping during the race. In contrast the rest of the suit focuses on comfort, durability and aerodynamics; allowing you to record your best time ever. There have been several cases when competitors have reported the neckline starts to balloon during the race. This can be uncomfortable and cost you valuable time. The suit comes in a variety of sizes but, thanks to the compression element the legs are a tight fit. This can make it difficult to find the right size for your needs. That said, once it’s on you’ll feel fantastic and be eager to race! 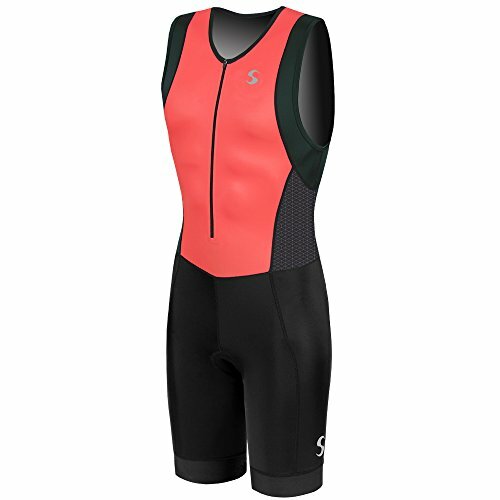 The Synergy tri suit is well designed, comes from an experienced tri-athlete and is available at a great price. This makes it the perfect suit for anyone starting out or on a budget. If you’re looking to move up a little and spend a little more the Zoot Sports Ultra offers excellent value. But, the winner, on account of it simply being the best in all the categories is the 2XU Elite compression tri suit; it may cost a little more but it will deliver when you need it the most.